Made from real wood, the beautiful birch finish of our exclusive Elfa Décor elements is the perfect starting point for a closet designed to showcase sophisticated Drawers, Shelves, ample hanging space and accessories. Available only at The Container Store, this Birch Elfa Décor Reach-In Closet features room for long- and short-hanging garments and shelf space for accessories. 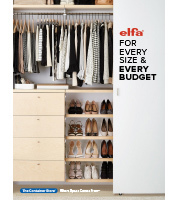 Our Elfa Decor Drawer Fronts & Frames, Mirror and Accessory Shelf maximize the look and feel within any space. All Elfa components are adjustable, so the solution is completely flexible. This is designed to fit a 11' reach-in closet. If this won't work for your space, please contact us so we can design the perfect solution for you with our free service. I'm not crazy about the pulls on the drawers. Is it possible to use other pulls? Also, are there drawers for jewelry? Yes, we do have other drawer options. Please give us a call at 800-733-3532 to customize a design for your space.